Sweden, December 15, 30 or so nazis from the Swedish Resistance Movement (SMR) attempted to disrupt a rally against racism comprised of local Karrtorp residents and anti-fascist organisations. After recent SMR activities in and around the area of Karrtorp, a suburb of Stockholm, local residents, Line 17 Network, and various other organizations held a rally against racism. Reports claim anywhere from 200 to 500 people in attendance. Sometime during the rally thirty or so SMR members showed up and were prepared for street combat. Carrying makeshift shields, knifes, glass bottles, and dressed ready to fight, SMR attacked the rally. The rally was populated with everyone from elderly pensioners to young families with baby strollers in tow. From reports and information coming out, as people who needed to protect their own families withdrew, local residents, Revolutionary Front, and Anti Fascist Action launched into a counter-attack and pushed back the initial SMR attack. SMR was effectively and rather quickly pushed back and forced to retreat due to a substantial portion of the rally participants pushing SMR out of the square and into the woods. The rally turned into a march following and undermining SMR's efforts to disrupt. Small skirmishes and altercations continued as the police were unwilling or unable to maintain the control the strive for. From within the Swedish Nazi-movement Svenska Motståndsrörelsen (SMR) [who] are [considered] the hardest and most violent. They thrive on their self made myth that they are the hardest aryan supermen the north has ever seen. Yesterday this myth was busted once again. Armed to the teeth, with knifes, shields and pyrotechnics 30 nazis attacked a peaceful demonstration filled with elderly and children. Unfortunately for them, we and our comrades from AFA Sthlm were there. After their initial progress throwing everything they had at us we pushed them back together with the local people from the area. Bleeding they ran, leaving their comrades behind to be treated the way we treat nazis. The end result was clear, 28 arrested nazis, 1 stabbed, several bleading - no arrested socialists. During the street fighting, people regained themselves and linked up with the group engaged with SMR and the police. Interestingly the police were severally under prepared for this event, only having six or so police at the rally. Despite the Swedish Security Forces and police having prior knowledge that SMR was planning an attack against the rally, the Stockholm police had decided to only send six or so police to the rally. The police that were present quickly linked up with SMR in an attempt to "keep control" even though their efforts in fact harboured and protected the same group that had just attacked a rally with elderly and children present. Twenty-eight men from SMR, varying in ages from fifteen to thirty, are still detained. So I sorted out the pictures so that they show up in the article.. cheers for the update! Note the nazi to the right with a bag on his "hand" in the second picture above. This morning I was greeted by lots of Nazi grafitti. Fuckers been out all night spraying. The demo will run again on sunday. Figured I should add some context. Swedish nazis have been rather quiet in the urban areas for the last couple of years but with the stuff going on in the rest of Europe and with a racist party in parliament they seem to feel they can make a push in urban areas. "Motståndsrörelsen" the sect involved in this incident is by far the most violent of the swedish groupings and have a very bloodstained CV. The pictures above from the forest is from the area just south of the Kärrtorp IP sports ground seen to the east of Kärrtorp in the map above. This is the same sports ground where they earlier this autumn were practicing marching and sieg heiling next to bewildered school children. What's the difference between Revolutionary Front and AFA? Simple answer: RF is a political class struggle organisation with a heavy focus on antifascism. AFA is an antifascist network. Beyond that the difference is probably best explained by their propaganda or lack thereof. The politics of Swedish orgs are much less the defined than what you'd expect in the UK. Both would probably call themselves libertarian but last time I checked the revfront.org website (now down) they were prominently supporting armed irish dudes on the front page. [...] last time I checked the revfront.org website (now down) they were prominently supporting armed irish dudes on the front page. The way I've always viewed the difference between Rev Front and Swedish AFA was like the difference between Red Action and British AFA (the Rev Front might be more libertarian in politics though).. I actually think Rev Front might have explicitly modeled themselves on Red Action, hence the armed Irish dudes.. So I arrived a little late to the demo and came out of the metro station right in the middle of this, around the 2 minute mark in the video above. SMR really are a bunch of violent psychopaths. 3 of their members were involved in a murder just last year, where a guy, Joakim Karlsson, was stabbed eight times, stomped on the head and died a few days later in hospital. As recently as this summer SMR were at a fascist military training camp in Hungary. That said, you'll notice in the 3rd picture the Nazi in the blue jeans has pissed himself. The attack on the demo itself has to be seen in the context of the community organising taking place in the area by Linje 17, which is just another example of some of the neighbourhood and community organising by different groups taking place in Stockholm and Sweden at the moment. Apart from the demo itself having been a response to nazi graffiti, stickers and propaganda in the neighbourhood, it is a territorial question for SMR as well as an attempt to smash this local self organisation. The follow up demo this sunday has a facebook event attendance of over 13,000 and is still growing. Mainstream parties and even the head of the Social Democrats will be making an appearance. Pretty much this. They're an odd mixed bag though. At the end of November several members were arrested and had their homes raided by the Swedish security services, primarily for incidents at the time of a fascist march in September but also just for their ongoing work. There's a further wider context here though that I'll come back to later. Today 16,000 people rallied against Nazism and against the thwarted SMR attack from last week in Karrtorp, images here (from aftonbladet, a evening newspaper in sweden). However, a suspected antifascist has been detained by the police following last weeks defense against the SMR failed attack in Karrtorp. Somehow the state is reasoning that being attacked by 30 men with glass bottles, knifes, shields, and other weapons andthen reacting in self defense is attempted manslaughter. Revolutionary Front is asking for support letters to be written to cheer up the detained individual. Send a personal message to Revolutionary Front on Facebook and they will relay the messages. An anti-fascist in Stockholm has been arrested for defending a demonstration against the Nazis in Kärrtorp a week ago. It could have been you or I who now sits behind bars over Christmas & New Year. Please write a letter or Christmas card with some encouraging lines to the following address: Joel Almgren, Box 1274, 141 21 Huddinge, Sweden. Please spread to comrades and friends in other cities! "We, anti-fascists of Stockholm, call upon the international left-wing movement to show solidarity and support to one of our imprisoned comrades. He is in jail for defending a local community-organized anti-racist demonstration in the Kärrtorp area of Stockholm against a brutal nazi-attack on the 15th of December. Locals of all sorts, including parents with their children, elderly and youth, gathered in their neighborhood to show strength against a nazi organisation that had been attacking local anti-racists and spreading nazi propaganda in schools in the area. They gathered in a peaceful protest when they were attacked by the most militant nazi group in Sweden with knives, sticks and glass bottles. 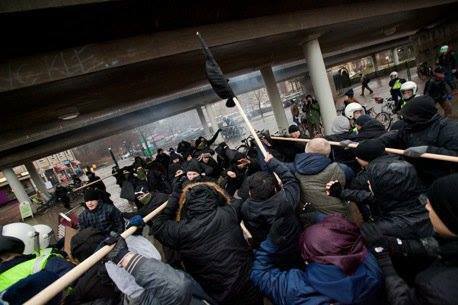 Anti-fascists at the scene defended the local families from the attack and were injured themselves. One of the anti-fascists got arrested by the police a few days later although the anti-fascists did nothing but defend themselves. A week later, on the 22nd of December, the largest manifestation in modern history in Sweden against racism and nazism took place in the same area. Around 20.000 people gathered with a clear message: Nazis are not welcome in our society! Although the left-wing people of Stockholm showed strength we need your solidarity, your solidarity actions and your letters to our imprisoned comrade!"